This week's Forum poll is a reversal from last week's, which showed a clear Conservative lead. It is not only good for the Liberals, who lead by 4, but also for the NDP, who are at a relatively high 26% nationally and 34% in Québec. 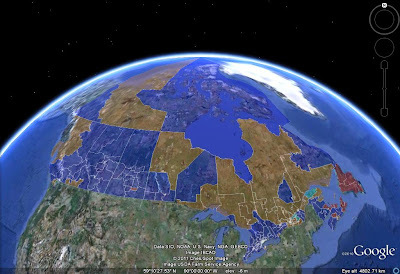 (However, Forum was the pollster that had the NDP up to 40% nationally and 54% in Québec earlier in the campaign, so maybe the NDP numbers don't mean much.) The silver lining for the Tories is that the Liberal lead in ON is only 3 points, less than the national lead. 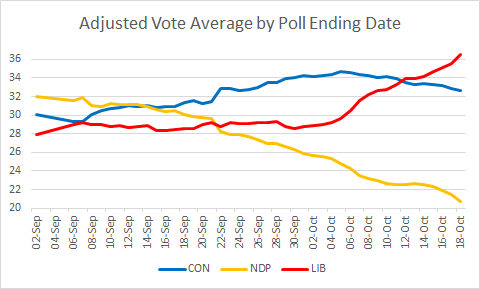 Today's Nanos suggests that the NDP has stopped sliding - holding steady at 30% in Québec, and actually up a tick to 24% nationally. As you can see, there is really not much divergence, and the race is probably around 33-33-24. 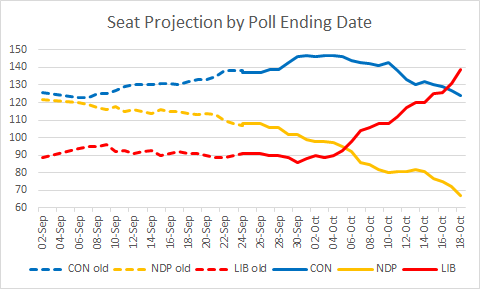 (The unadjusted projection below has the NDP a little higher and the Liberals a little lower mainly due to residual weight on earlier polls.) In Ontario, all five pollsters have a Liberal lead of 3-7 points. Note that this projection does not take into account riding polls released today. I'll incorporate them with my EKOS update this afternoon.